Traditional chait latte garnished with spices. 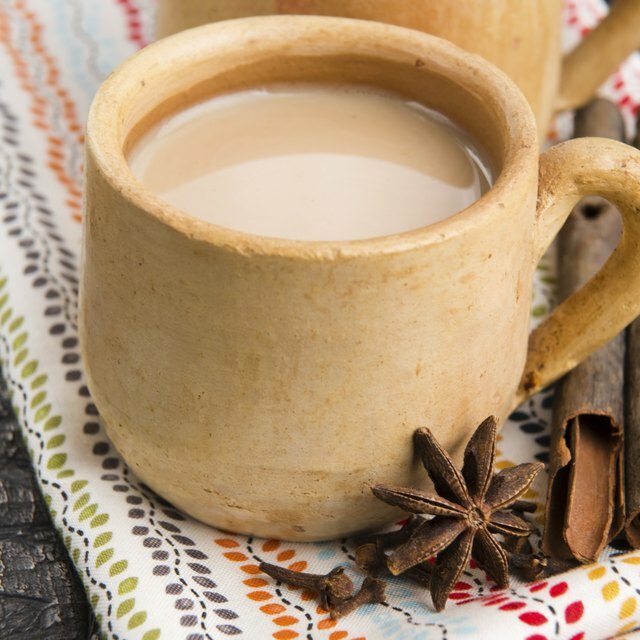 Chai tea originated in India and refers to a special preparation of standard black tea. Spices and sweeteners are combined with the black tea to create a distinct flavor, which is then brewed with milk. Commercial coffeehouses, like Starbucks, created their own versions of the tea drink as it increased in popularity. Starbucks’s chai tea latte is a flavorful alternative to espresso lattes with the same energy-boosting benefits. The standard version of the chai tea latte contains 2 percent milk mixed with a chai tea latte concentrate. The concentrate ingredients are water, black tea, black pepper, cardamom, cinnamon, ginger, cloves, natural flavors, star anise, cane sugar, honey, ginger juice, natural flavors, vanilla and citric acid. You can order the latte hot with steamed milk, iced or blended. A short latte is an 8-ounce serving with 50 milligrams of caffeine. It has 120 calories of which 20 calories are from fat. There are 2 grams of total fat of which 1.5 grams are saturated fat. It also has 10 milligrams of cholesterol, 50 milligrams of sodium, 22 grams of total carbohydrates of which 21 grams are sugar, and 4 grams of protein. A short latte also contains 4 percent of your daily vitamin A and 15 percent of your daily calcium requirements. A tall latte has 12 ounces in a serving with 75 milligrams of caffeine. It contains 180 calories of which 30 calories are from fat. There are 3 grams of total fat of which 2 grams are saturated fat. It also has 15 milligrams of cholesterol, 75 milligrams of sodium, 33 grams of total carbohydrates of which 31 grams are sugar, as well as 6 grams of protein. It has 6 percent of your daily vitamin A, 20 percent of your daily calcium and 2 percent of your daily iron needs. Grande lattes have 16 ounces in a serving and 100 milligrams of caffeine. They contain 240 calories of which 35 calories are from fat. There are 4 grams of total fat of which 2.5 grams are saturated fat. There are also 15 milligrams of cholesterol, 95 milligrams of sodium, 44 grams of total carbohydrates of which 41 grams are sugar, and 7 gram of protein. Grande lattes have 8 percent of your vitamin A, 25 percent of your calcium and 2 percent of your daily iron needs. A venti latte is the largest size available at 20 ounces with 120 milligrams of caffeine. It has 300 calories of which 45 calories are from fat. It has 5 grams of total fat of which 3.5 grams are saturated fat. It also has 20 milligrams of cholesterol, 120 milligrams of sodium, 55 grams of total carbohydrates of which 52 grams are sugar, and 79 grams of protein. A venti latte has 10 percent, 2 percent and 30 percent of your daily vitamin A, iron and calcium requirements, respectively. 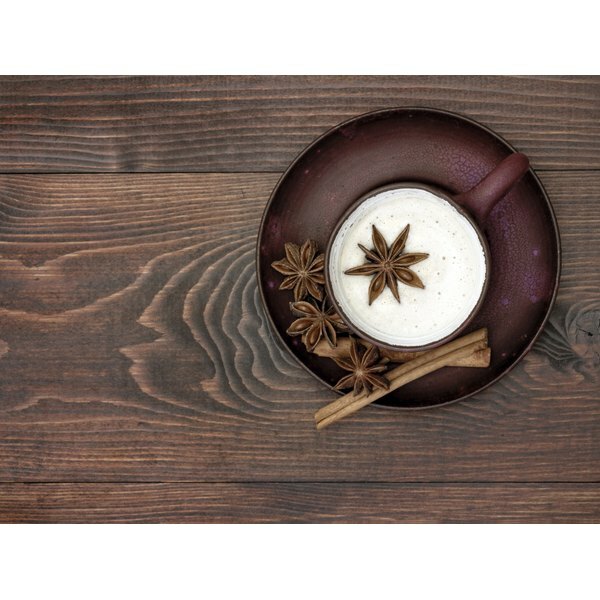 Modifications you can make to the chai tea latte include changing milk options and increasing or decreasing the amount of chai tea concentrate added. Using fat-free milk cuts outs all of the fat and some calories, but the amount of sugar in each drink actually increases, as does the protein. You can also choose soy milk if you have issues digesting milk, but since regular soy milk is used instead of light soy milk, it does not drastically improve the nutrition. Soy milk decreases some calories and fat, removes all saturated fat and cholesterol, but increases sugar. But it also adds fiber and more iron to your drink. Does Vodka Settle to the Bottom of a Mixed Drink?